Desde a Place du Palais (ver post aqui) subimos até ao Rocher des Dom (ver post aqui), um jardim onde vimos crianças divertidas a andar em triciclos, uns pequenos lagos com belas esculturas e uma esplanada ideal para aproveitar o bom tempo que fazia. 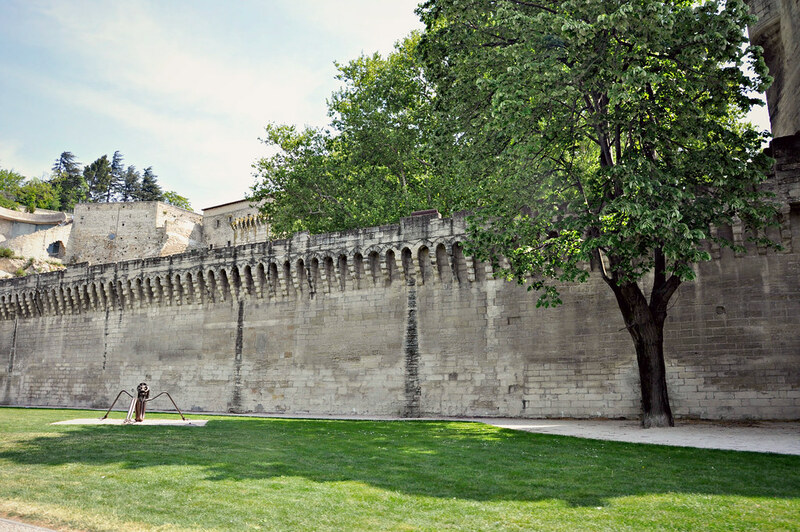 Seguimos até á Catedral de Avignon colada ao Palácio dos Papas, a sua construção começa no século XII e termina no século XVI. No topo da sua torre uma estátua dourada a Virgem Maria, é o que mais a faz destacar. From the Place du Palais (see post here) we went up to the Rocher des Dom (see post here), a garden where we saw children having fun riding tricycles, small lakes with beautiful sculptures and a terrace ideal to enjoy the good weather. 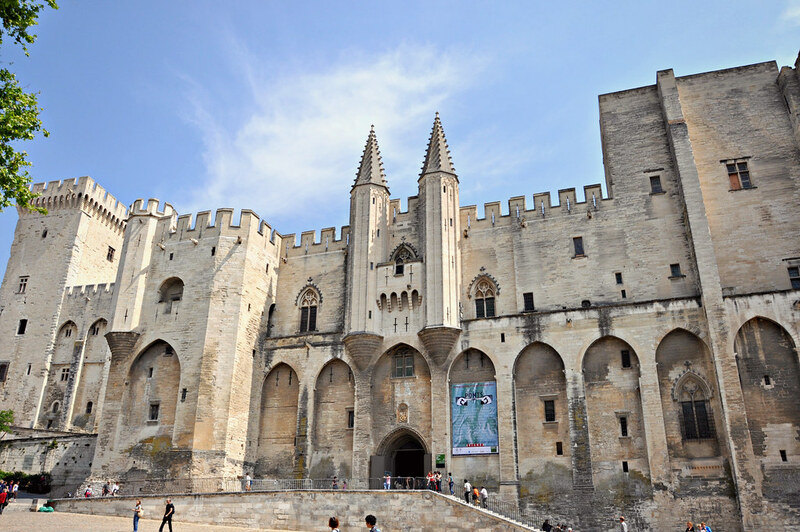 We continue to the Cathedral of Avignon glued to the Palace of the Popes, its construction begins in the twelfth century and ends in the sixteenth century. 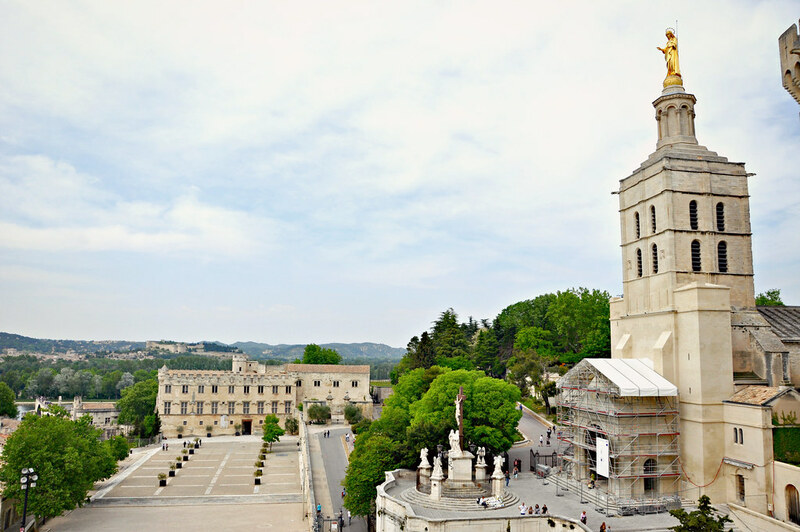 At the top of its tower is a golden statue of the Virgin Mary, which makes her stand out. Passámos depois pelo Museu do Petit Palais, foi construido a pedido do Cardeal Bérenger de Frédol, o Velho que viveu no século XIV mas se está em tão bom estado foi pela sua remodelação no século XVI e consequentes recuperações. No seu interior está um museu que contém algumas obras de arte do gótico e do renascimento de artistas importantes, muitos italianos como Boticelli. Por trás do palácio e do outro lado do rio está o Castelo de Villenueve les Avignons. 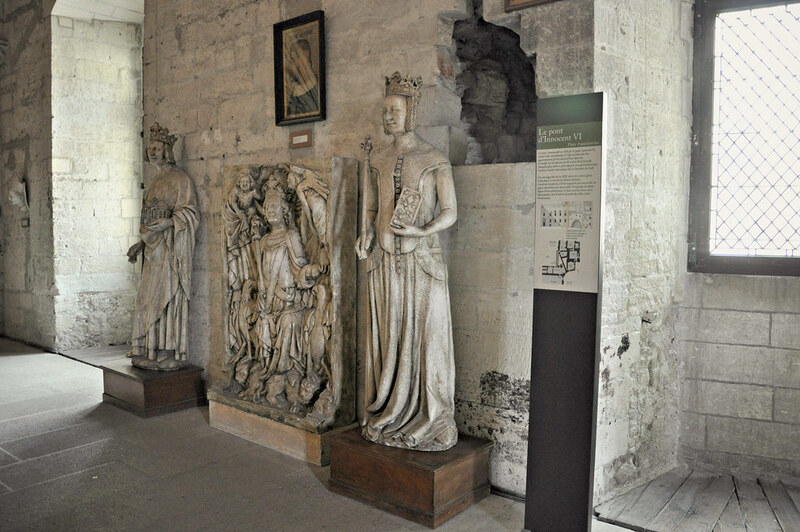 We then passed by the Museum of the Petit Palais, was built at the request of Cardinal Bérenger de Frédol, the Old Man who lived in the fourteenth century but if it is in such good condition was because of its remodeling in the sixteenth century and subsequent recoveries. Inside is a museum containing some works of art from the Gothic and Renaissance of important artists, many Italians like Boticelli. 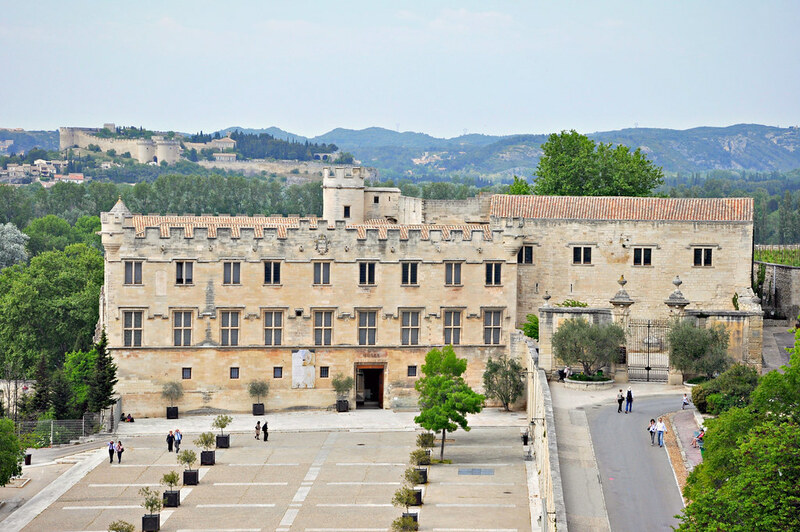 Behind the palace and across the river is the Castle of Villenueve les Avignons. Começamos a descer em direcção á Ponte Saint-Bénézet (ver post aqui) construída no século XII se bem que hoje em dia podemos apenas ver quatro dos vinte arcos que tinha originalmente. Ligaria as duas margens do Rio Ródano e tem uma pequena capela instalada logo no inicio dedicada a Saint Nicholas. We begin to descend towards the Saint-Bénézet Bridge (see post here) built in the 12th century although today we can only see four of the twenty arches that it had originally. 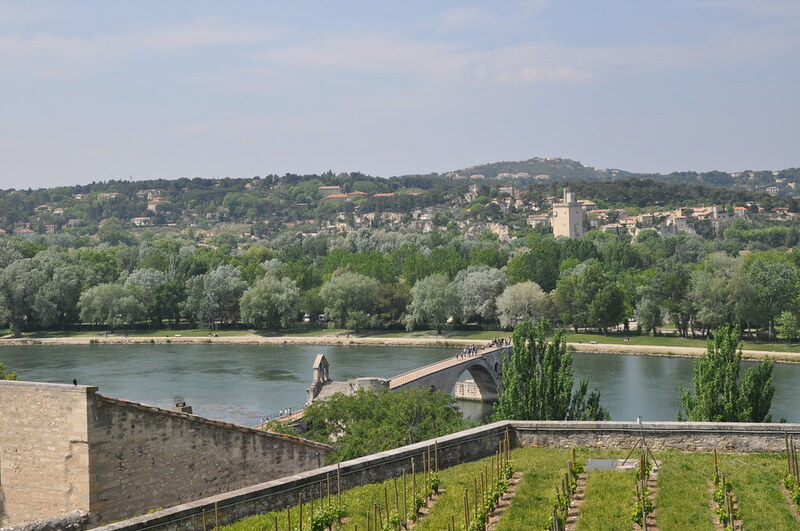 It would connect the two banks of the River Rhone and have a small chapel installed at the beginning dedicated to Saint Nicholas. Começámos a contornar as Muralhas Medievais para voltar a entrar no centro histórico, a sua construção data do século XIV e para a sua idade a parte que ainda existe está em bom estado. 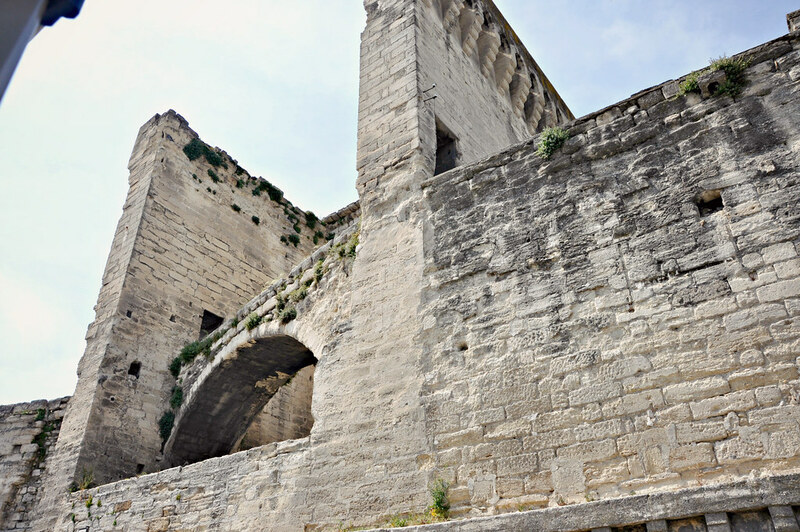 We began to go around the Medieval Walls to re-enter the historical center, its construction dates back to the 14th century and for its age the part that still exists is in good condition. Entrámos ao centro pela Place Crillon (ver post aqui), originalmente Place de la Comédie, recebia esse nome por ser onde estava instalado o seu teatro. Na sua história está um passado marcadamente dedicado ás artes e onde podemos encontrar algumas galerias de arte entre os cafés com as suas agradáveis esplanadas. We entered the center by the Place Crillon (see post here), originally Place de la Comédie, it was named after its theater. 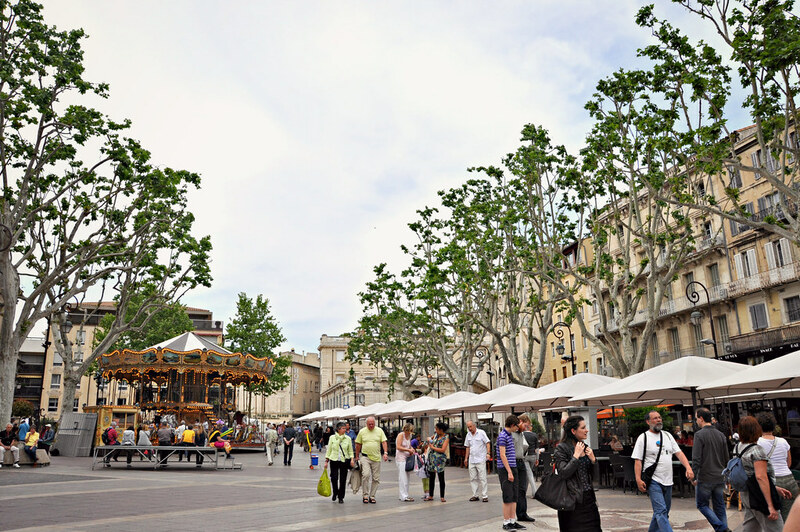 In its history there is a past markedly dedicated to the arts and it is where we can find some art galleries between the cafes with pleasant terraces. Regressámos ao nosso ponto de partida a Place du Palais (ver post aqui), lugar onde se encontram a maior parte dos edificios que fazem da cidade um World Heritage Site da UNESCO. Para além da Catedral, do Petit Palais está ainda o Hôtel des Monnaeis (em baixo na foto do lado direito), com o seu estilo barroco construído em 1619. Foi dedicado ao Papa Paulo V e na sua fachada podemos ver o seu brasão rodeado de anjos. O seu nome mudou para Conservatório de Música Olivier Messiaen, porque foi essa a utilização que lhe foi dada a partir de 1860 e é também uma homenagem ao compositor que nasceu na cidade a 1908. 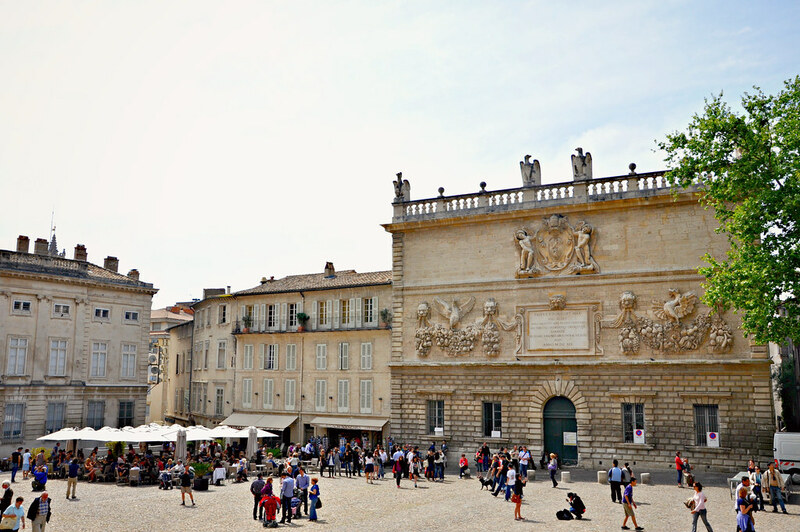 We returned to our starting point at the Place du Palais (see post here), where most of the buildings that make the city a World Heritage Site of UNESCO. In addition to the Cathedral, the Petit Palais is also the Hôtel des Monnaeis (below in the picture on the right) with its Baroque style built in 1619. It was dedicated to Pope Paul V and on its façade we can see its coat of arms surrounded by Angels. 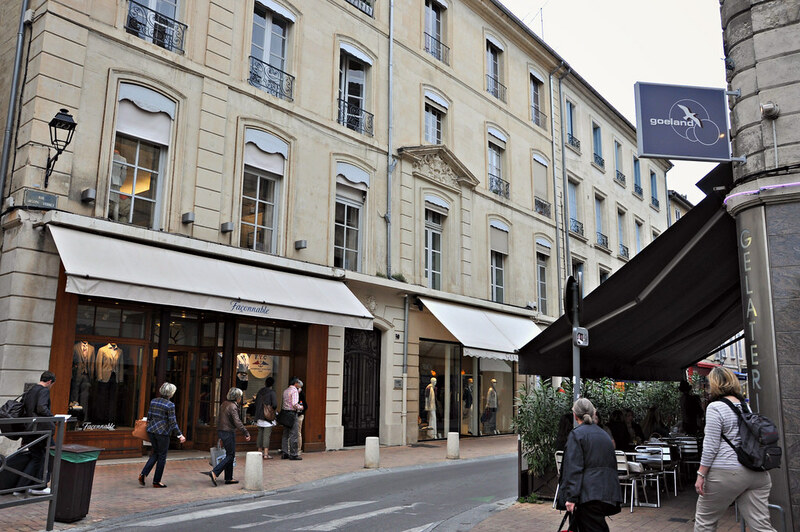 Its name changed to Olivier Messiaen Conservatory of Music, because it was the use that was given from 1860 and is also a tribute to the composer who was born in the city to 1908. Entrámos finalmente no Palácio dos Papas (ver post aqui), a tão aguardada visita que era o motivo de ter ido a Avinhão. É o maior e talvez o mais importante edificio de construção gótica da Europa que serviu de “casa” a alguns papas quando a partir do século XIV, o Papa Clemente V não quis ficar em Roma porque nessa cidade reinava o caos. 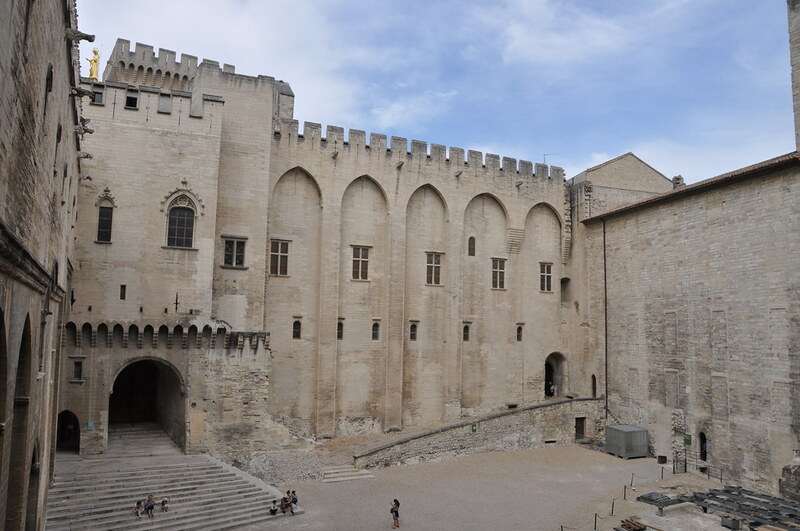 We finally entered the Palace of the Popes (see post here), the long awaited visit that was the reason to have gone to Avignon. It is the largest and perhaps the most important building of Gothic construction in Europe that served as a “home” to some popes when from the 14th century, Pope Clement V did not want to stay in Rome because chaos reigned in that city. As nuvens começaram a impedir os raios de sol retirando alguma alegria ao nosso passeio, tenho a certeza que a Place de L’Horloge (ver post aqui) ficaria ainda mais bonita. 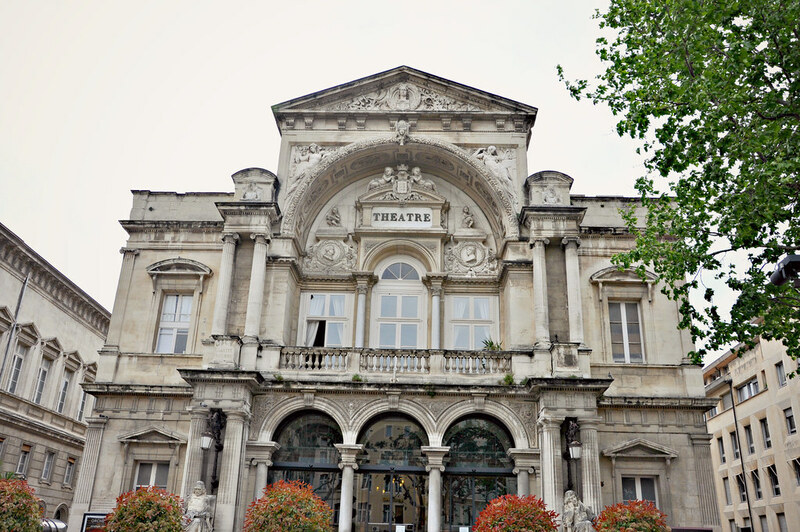 Nela podemos encontrar dois edificios relevantes: o Hôtel de Ville (Câmara Municipal) e o Teatro-Ópera. Com uma disposição rectangular, esta agradável praça tem vários restaurantes e cafés instalados nos elegantes edificios que a rodeiam, muitos com esplanada podendo usufruir do seu bom ambiente. The clouds began to block the rays of the sun, bringing some joy to our walk, I am sure that the Place de L’Horloge (see post here) would be even more beautiful. 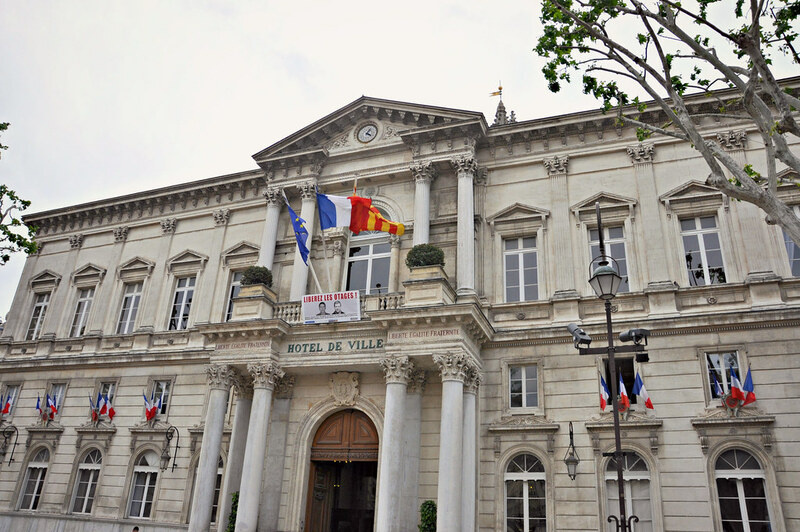 In it we can find two important buildings: the Hôtel de Ville (Town Hall) and the Opera-Theater. 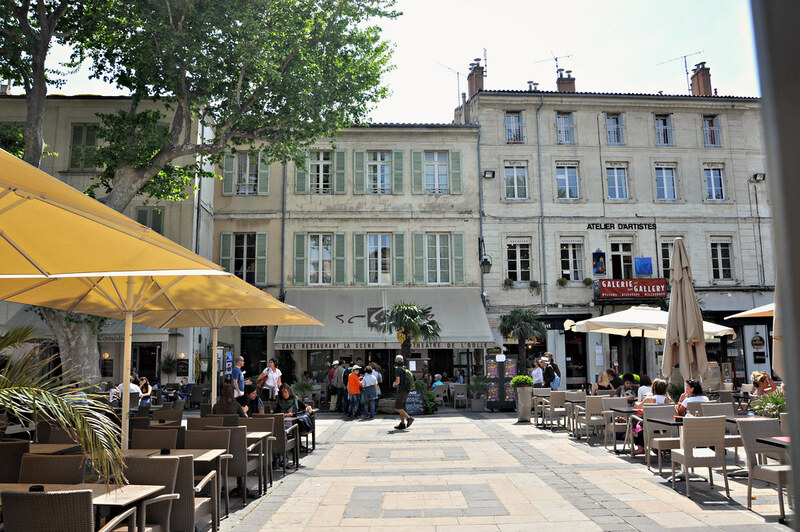 With a rectangular layout, this pleasant square has several restaurants and cafes installed in the elegant buildings that surround it, many with a terrace where you can enjoy its good atmosphere. 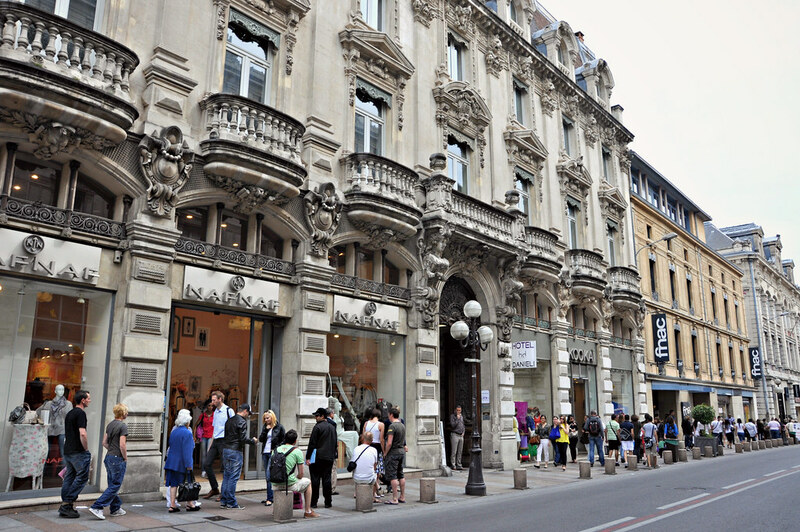 Seguimos por uma das suas principais artérias, a Rue de la Repúblique, uma animada rua repleta de lojas e elegantes edificios muitos do século XIX. Aqui decidimos fazer uma paragem e comer um gofre acabado de fazer com um delicioso molho de chocolate. 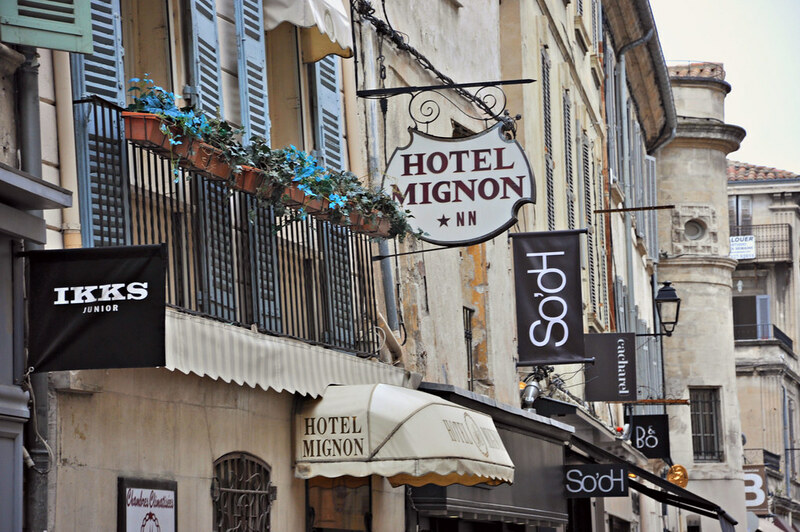 We follow one of its main arteries, the Rue de la Republique, a lively street lined with shops and many elegant 19th century buildings. 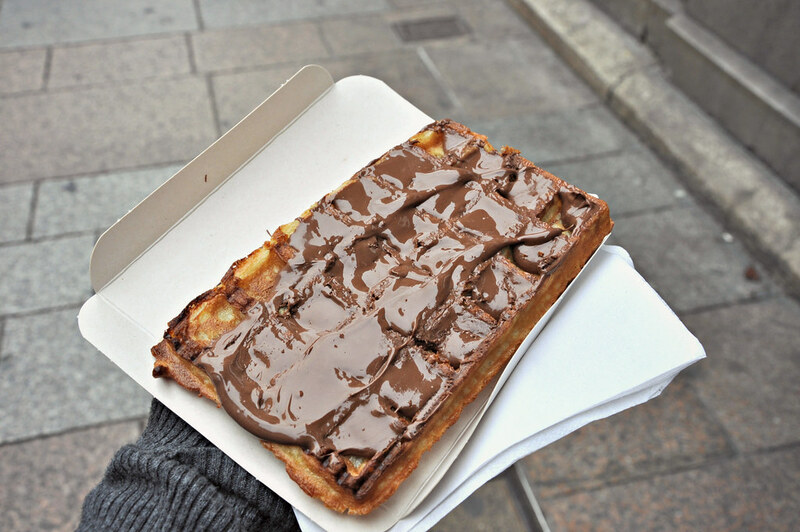 Here we decided to make a stop and eat a freshly made waffle with a delicious chocolate sauce. Já um pouco perdidos entramos na rua Saint Agricol, uma das muitas que Achei algo pitorescas, eram mais apertadas mas cheias de lojas de marcas menos comerciais e com espaços mais pequenos, acolhedores talvez. 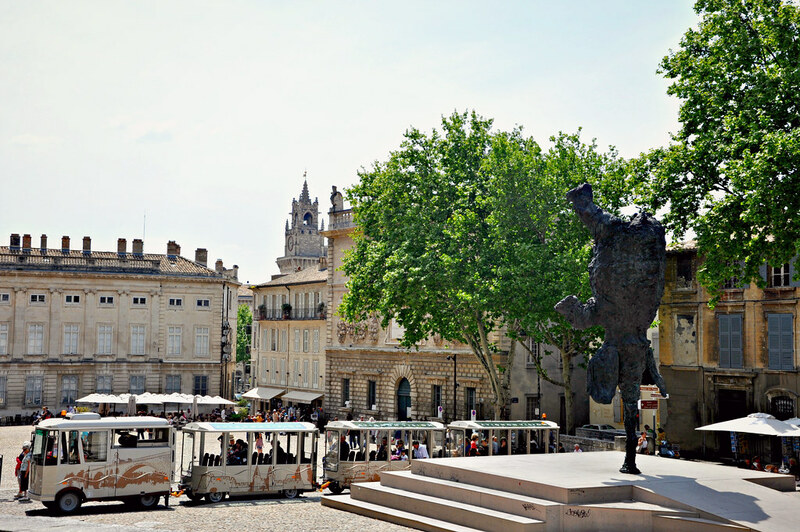 Nela terminámos a nossa visita a Avignon. Already a bit lost we entered the street Saint Agricol, one of the many that I found somewhat picturesque, a bit more narrow but full of shops of less commercial brands and with smaller, cozy spaces perhaps. 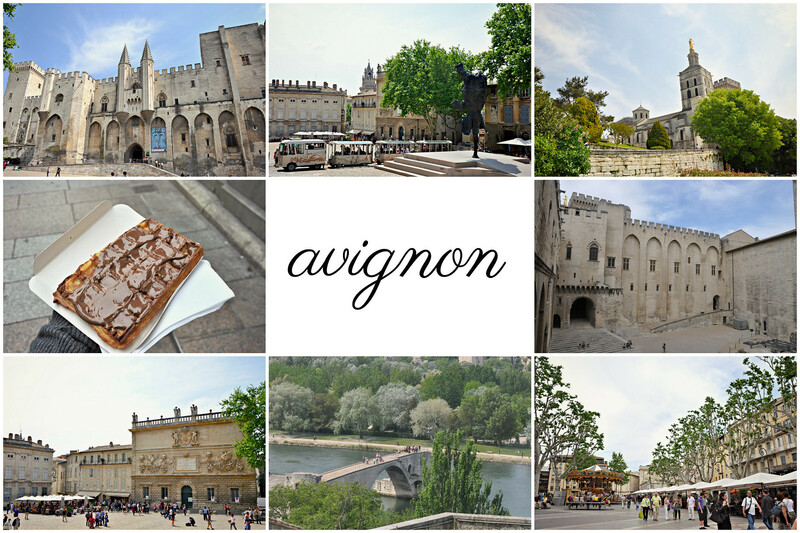 In it we finished our visit to Avignon.